In the previous tutorials you worked with a simple data model that was composed of three entities. In this tutorial you'll add more entities and relationships and you'll customize the data model by specifying formatting, validation, and database mapping rules. You'll see two ways to customize the data model: by adding attributes to entity classes and by adding code to the database context class. In this section you'll see how to customize the data model by using attributes that specify formatting, validation, and database mapping rules. Then in several of the following sections you'll create the complete School data model by adding attributes to the classes you already created and creating new classes for the remaining entity types in the model. For student enrollment dates, all of the web pages currently display the time along with the date, although all you care about for this field is the date. By using data annotation attributes, you can make one code change that will fix the display format in every view that shows the data. 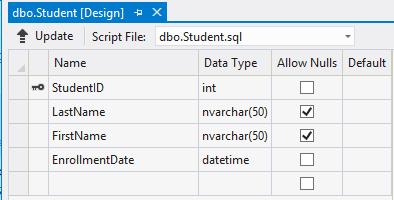 To see an example of how to do that, you'll add an attribute to the EnrollmentDate property in the Student class. The DataType attribute is used to specify a data type that is more specific than the database intrinsic type. In this case we only want to keep track of the date, not the date and time. The DataType Enumeration provides for many data types, such as Date, Time, PhoneNumber, Currency, EmailAddress and more. The DataType attribute can also enable the application to automatically provide type-specific features. For example, a mailto: link can be created for DataType.EmailAddress, and a date selector can be provided for DataType.Date in browsers that support HTML5. The DataType attributes emits HTML 5 data- (pronounced data dash) attributes that HTML 5 browsers can understand. The DataType attributes do not provide any validation. DataType.Date does not specify the format of the date that is displayed. By default, the data field is displayed according to the default formats based on the server's CultureInfo. The browser can enable HTML5 features (for example to show a calendar control, the locale-appropriate currency symbol, email links, etc.). By default, the browser will render data using the correct format based on your locale. If you use the DataType attribute with a date field, you have to specify the DisplayFormat attribute also in order to ensure that the field renders correctly in Chrome browsers. For more information, see this StackOverflow thread. Run the Student Index page again and notice that times are no longer displayed for the enrollment dates. The same will be true for any view that uses the Student model. The MaxLength attribute provides similar functionality to the StringLength attribute but doesn't provide client side validation. The model backing the 'SchoolContext' context has changed since the database was created. Consider using Code First Migrations to update the database (https://go.microsoft.com/fwlink/?LinkId=238269). The add-migration MaxLengthOnNames command creates a file named <timeStamp>_MaxLengthOnNames.cs. This file contains code that will update the database to match the current data model. The timestamp prepended to the migrations file name is used by Entity Framework to order the migrations. After you have created multiple migrations, if you drop the database, or if you deploy the project by using Migrations, all of the migrations are applied in the order in which they were created. Run the Create page, and enter either name longer than 50 characters. As soon as you exceed 50 characters, client side validation immediately shows an error message. You can also use attributes to control how your classes and properties are mapped to the database. Suppose you had used the name FirstMidName for the first-name field because the field might also contain a middle name. But you want the database column to be named FirstName, because users who will be writing ad-hoc queries against the database are accustomed to that name. To make this mapping, you can use the Column attribute. The Column attribute specifies that when the database is created, the column of the Student table that maps to the FirstMidName property will be named FirstName. In other words, when your code refers to Student.FirstMidName, the data will come from or be updated in the FirstName column of the Student table. If you don't specify column names, they are given the same name as the property name. 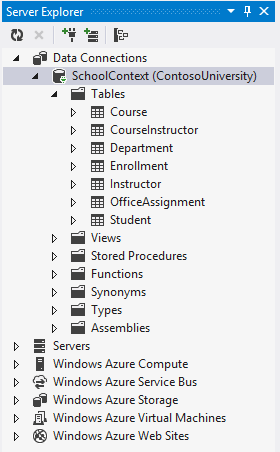 In Server Explorer (Database Explorer if you are using Express for Web), double-click the Student table. The following image shows the original column name as it was before you applied the first two migrations. In addition to the column name changing from FirstMidName to FirstName, the two name columns have changed from MAX length to 50 characters. You can also make database mapping changes using the Fluent API, as you'll see later in this tutorial. If you try to compile before you finish creating all of these entity classes, you might get compiler errors. Notice that several properties are the same in the Student and Instructor entities. In the Implementing Inheritance tutorial later in this series, you'll refactor using inheritance to eliminate this redundancy. 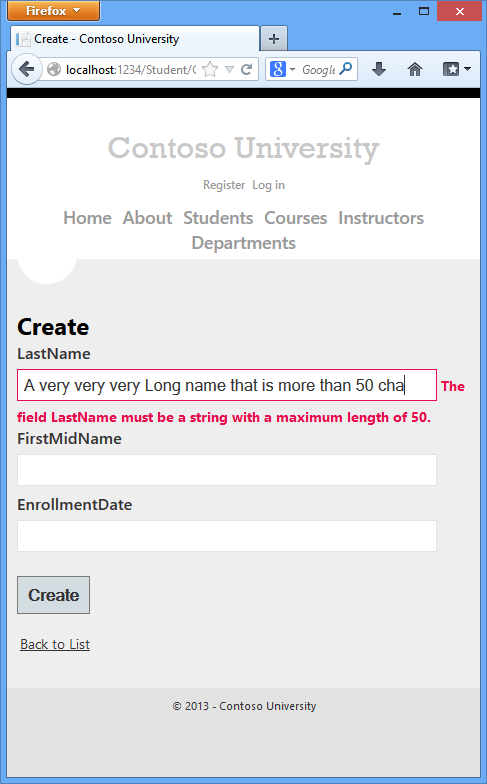 The attributes on the LastName property specify that it's a required field, that the caption for the text box should be "Last Name" (instead of the property name, which would be "LastName" with no space), and that the value can't be longer than 50 characters. FullName is a calculated property that returns a value that's created by concatenating two other properties. Therefore it has only a get accessor, and no FullName column will be generated in the database. The Courses and OfficeAssignment properties are navigation properties. As was explained earlier, they are typically defined as virtual so that they can take advantage of an Entity Framework feature called lazy loading. In addition, if a navigation property can hold multiple entities, its type must implement the ICollection<T> Interface. (For example IList<T> qualifies but not IEnumerable<T> because IEnumerable<T> doesn't implement Add. An instructor can teach any number of courses, so Courses is defined as a collection of Course entities. Our business rules state an instructor can only have at most one office, so OfficeAssignment is defined as a single OfficeAssignment entity (which may be null if no office is assigned). Build the project, which saves your changes and verifies you haven't made any copy and paste errors the compiler can catch. You can also use the Key attribute if the entity does have its own primary key but you want to name the property something different than classnameID or ID. By default EF treats the key as non-database-generated because the column is for an identifying relationship. Unable to determine the principal end of an association between the types 'ContosoUniversity.Models.OfficeAssignment' and 'ContosoUniversity.Models.Instructor'. The principal end of this association must be explicitly configured using either the relationship fluent API or data annotations. Later in the tutorial we'll show how to configure this relationship with the fluent API. The Instructor entity has a nullable OfficeAssignment navigation property (because an instructor might not have an office assignment), and the OfficeAssignment entity has a non-nullable Instructor navigation property (because an office assignment can't exist without an instructor -- InstructorID is non-nullable). 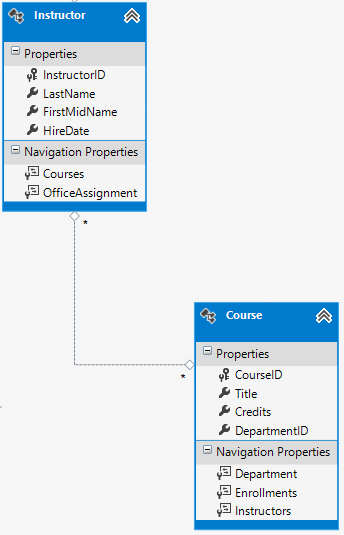 When an Instructor entity has a related OfficeAssignment entity, each entity will have a reference to the other one in its navigation property. You could put a [Required] attribute on the Instructor navigation property to specify that there must be a related instructor, but you don't have to do that because the InstructorID foreign key (which is also the key to this table) is non-nullable. The course entity has a foreign key property DepartmentID which points to the related Department entity and it has a Department navigation property. 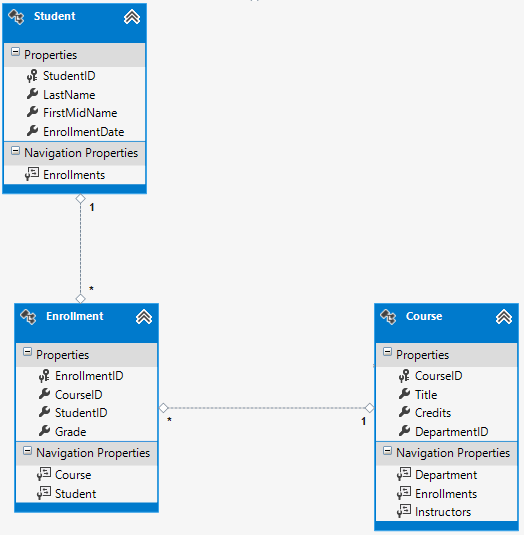 The Entity Framework doesn't require you to add a foreign key property to your data model when you have a navigation property for a related entity. EF automatically creates foreign keys in the database wherever they are needed. But having the foreign key in the data model can make updates simpler and more efficient. For example, when you fetch a course entity to edit, the Department entity is null if you don't load it, so when you update the course entity, you would have to first fetch the Department entity. When the foreign key property DepartmentID is included in the data model, you don't need to fetch the Department entity before you update. The DatabaseGenerated attribute with the None parameter on the CourseID property specifies that primary key values are provided by the user rather than generated by the database. By default, the Entity Framework assumes that primary key values are generated by the database. That's what you want in most scenarios. However, for Course entities, you'll use a user-specified course number such as a 1000 series for one department, a 2000 series for another department, and so on. A course is assigned to one department, so there's a DepartmentID foreign key and a Department navigation property for the reasons mentioned above. Column mapping is generally not required, because the Entity Framework usually chooses the appropriate SQL Server data type based on the CLR type that you define for the property. The CLR decimal type maps to a SQL Server decimal type. But in this case you know that the column will be holding currency amounts, and the money data type is more appropriate for that. In Models\Student.cs, replace the code you added earlier with the following code. The changes are highlighted. There's a many-to-many relationship between the Student and Course entities, and the Enrollment entity functions as a many-to-many join table with payload in the database. This means that the Enrollment table contains additional data besides foreign keys for the joined tables (in this case, a primary key and a Grade property). 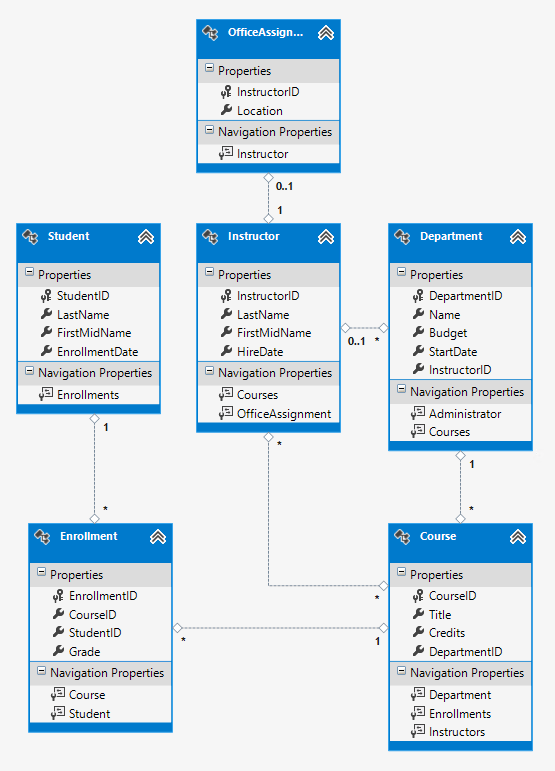 The Entity Framework automatically creates the CourseInstructor table, and you read and update it indirectly by reading and updating the Instructor.Courses and Course.Instructors navigation properties. The following illustration shows the diagram that the Entity Framework Power Tools create for the completed School model. Besides the many-to-many relationship lines (* to *) and the one-to-many relationship lines (1 to *), you can see here the one-to-zero-or-one relationship line (1 to 0..1) between the Instructor and OfficeAssignment entities and the zero-or-one-to-many relationship line (0..1 to *) between the Instructor and Department entities. Some developers prefer to use the fluent API exclusively so that they can keep their entity classes "clean." You can mix attributes and fluent API if you want, and there are a few customizations that can only be done by using fluent API, but in general the recommended practice is to choose one of these two approaches and use that consistently as much as possible. For the many-to-many relationship between the Instructor and Course entities, the code specifies the table and column names for the join table. Code First can configure the many-to-many relationship for you without this code, but if you don't call it, you will get default names such as InstructorInstructorID for the InstructorID column. For information about what "fluent API" statements are doing behind the scenes, see the Fluent API blog post. Replace the code in the Migrations\Configuration.cs file with the following code in order to provide seed data for the new entities you've created. When you create a Course object, you initialize the Instructors navigation property as an empty collection using the code Instructors = new List<Instructor>(). 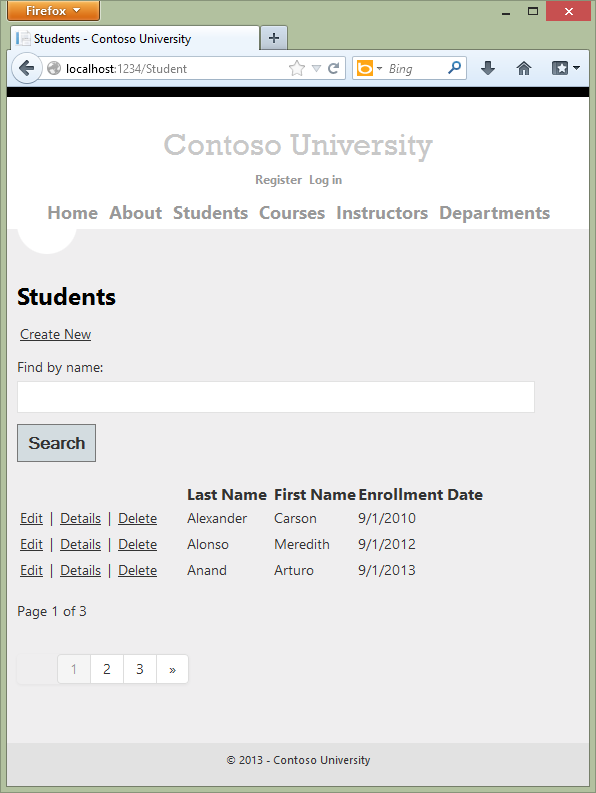 This makes it possible to add Instructor entities that are related to this Course by using the Instructors.Add method. If you didn't create an empty list, you wouldn't be able to add these relationships, because the Instructors property would be null and wouldn't have an Add method. You could also add the list initialization to the constructor. The ALTER TABLE statement conflicted with the FOREIGN KEY constraint "FK_dbo.Course_dbo.Department_DepartmentID". The conflict occurred in database "ContosoUniversity", table "dbo.Department", column 'DepartmentID'. // Create  a department for course to point to. //  default value for FK points to department created above. Sometimes when you execute migrations with existing data, you need to insert stub data into the database to satisfy foreign key constraints, and that's what you're doing now. The generated code adds a non-nullable DepartmentID foreign key to the Course table. 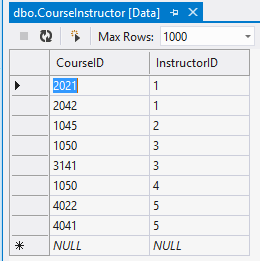 If there are already rows in the Course table when the code runs, the AddColumn operation would fail because SQL Server doesn't know what value to put in the column that can't be null. Therefore you've changed the code to give the new column a default value, and you've created a stub department named "Temp" to act as the default department. As a result, if there are existing Course rows when this code runs, they will all be related to the "Temp" department. When the Seed method runs, it will insert rows in the Department table and it will relate existing Course rows to those new Department rows. If you haven't added any courses in the UI, you would then no longer need the "Temp" department or the default value on the Course.DepartmentID column. To allow for the possibility that someone might have added courses by using the application, you'd also want to update the Seed method code to ensure that all Course rows (not just the ones inserted by earlier runs of the Seed method) have valid DepartmentID values before you remove the default value from the column and delete the "Temp" department. After you have finished editing the <timestamp>_Chap4.cs file, enter the update-database command in the PMC to execute the migration. With a new database, there is no data to migrate, and the update-database command is much more likely to complete without errors. For instructions on how to delete the database, see How to Drop a Database from Visual Studio 2012. You didn't create a model class for the CourseInstructor table. 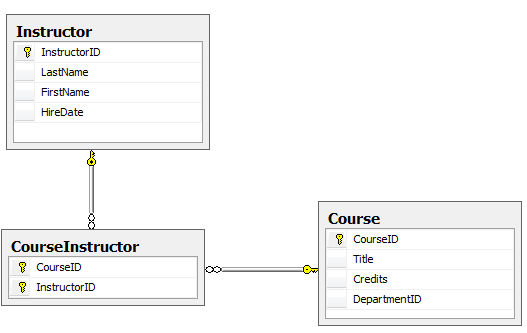 As explained earlier, this is a join table for the many-to-many relationship between the Instructor and Course entities. Right-click the CourseInstructor table and select Show Table Data to verify that it has data in it as a result of the Instructor entities you added to the Course.Instructors navigation property. You now have a more complex data model and corresponding database. In the following tutorial you'll learn more about different ways to access related data.